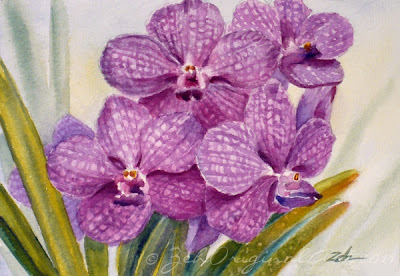 "Purple Orchids" original watercolor - for sale in my Original Art Shop! These beautiful purple orchids were in the Foster Botanical Gardens orchid conservatory, a steamy hothouse filled with gorgeous orchids from many parts of the world. Though the Gardens has an orchid section outdoors, there are some that will not do well in Hawaii's comfortable climate. They need it hot and humid! There is quite a bit of detail to paint in these blooms since the color comes from the veins in the petals. So I painted the petals first with a pale pink-violet color. Then, with a darker violet, I painted the veins leaving pale spots to get the effect you see above.